This amazing product is ideally suited for home health care. 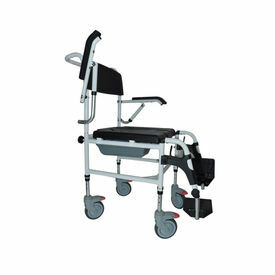 It is a shower chair + commode chair + wheel chair (for in-house use) with detachable foot rests and retractable arm rests. On top of that it is height adjustable. No more having to transfer patients from wheelchair to commode chair to bath chair and back, since this meets all the requirements. All 4 caster wheels are lockable. Seat width 43cm / 17"
Seat depth 38cm / 15"
Armrest height 23cm / 9"
Backrest height 45cm / 18"
Length 89 cm / 35"